A UK Euromillions ticketholder has scooped the jackpot of more than ￡71m. Friday's winning numbers were 03, 15, 24, 42 and 46, with Lucky Star numbers 09 and 12. The National Lottery urged players across the country to check their tickets to be in with a chance of claiming the ￡71,057,439 prize. It is the latest in a series of big UK lottery wins in recent years - including the fourth biggest in this year's New Year's Day draw. Then, a couple from Northern Ireland - Frances and Patrick Connolly - landed the ￡115m prize. A month earlier, builder Andrew Clark from Boston, Lincolnshire, was revealed as the winner of a ￡76m EuroMillions jackpot. He found his ticket tucked in the visor of his van six weeks after the draw. 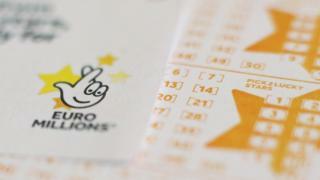 The largest EuroMillions prize in the UK in 2018 - and the third biggest win of all time - was ￡121m to an anonymous ticket-holder in April. The biggest lottery prize in UK history was the ￡161m EuroMillions jackpot won by North Ayrshire couple Chris and Colin Weir in 2011. Euromillions is played in nine countries - the UK, Austria, Belgium, France, the Irish Republic, Luxembourg, Portugal, Spain and Switzerland - with ticketholders trying to win a share of the same jackpot. UK residents will still be able to play after Brexit.